Antimetabolites are compounds closely related in structure to a cellular precursor molecule, yet these imposter substances are capable of preventing the proper use or formation of the normal cellular product. 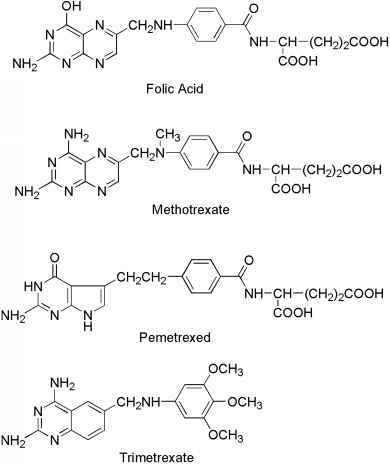 These antimetabolites are similar enough in structure in many cases to interact with the normal cellular process but differ in a manner sufficient to alter the outcome of that pathway. Most an-timetabolites are effective cancer chemotherapeutic agents via interaction with the biosynthesis of nucleic acids. Therefore, several of the useful drugs used in antimetabolite therapy are purines, pyrimidines, folates, and related compounds. The antimetabolite drugs may exert their effects by several individual mechanisms involving enzyme inhibition at active, allosteric, or related sites. Most of these targeted enzymes and processes are involved in the regulatory steps of cell division and cell/tissue growth. Often the administered drug is actually a prodrug form of an antimetabolite and requires activation in vivo to yield the active inhibitor. 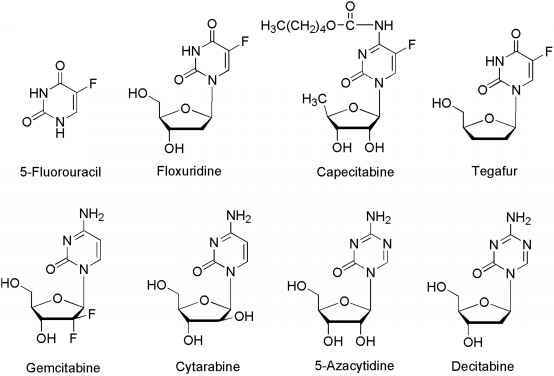 The administration of many purine and pyrimidine antimetabolites requires the formation of the nucleoside and finally the corresponding nucleotide for antimetabolite activity. An antimetabolite and its transformation products may inhibit several different enzymes involved in tissue growth. These substances are generally cell cycle specific with activity in the S phase. The purine and pyrimidine antimetabolites are often compounds incorporated into nucleic acids and the nucleic acid polymers (DNA, RNA, etc.). The antifolates are compounds designed to interact at cofactor sites for enzymes involved in the biosynthesis of nucleic acid bases. The biosynthesis of these nucleic acid bases depend heavily on the availability of folate cofactors, hence antimetabolites of the folates find utility as antineoplastic agents. 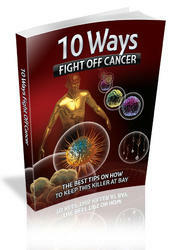 The antitumor effects of all these compounds attempting to masquerade as the natural precursor compound may occur because of a malfunction in the biosynthesis of the corresponding macro-molecules. Classic examples of pyrimidine and purine an-timetabolites are 5-fluorouracil and 6-mercaptopurine, respectively, and the classic antifolate is methotrexate. The purine analog 6-mercaptopurine and its bioactivation products interact with many enzymes in the various stages of cell division.52 The activity of 6-mercaptopurine requires bioactivation to its ribonucleotide, 6-thioinosinate, by the enzyme hypoxanthine-guanine phosphoribosyl transferase (HGPRT). 6-Thioinosinate is a potent inhibitor of the conversion of 5-phosphoribosylpyrophosphate into 5-phospho-ribosylamine. 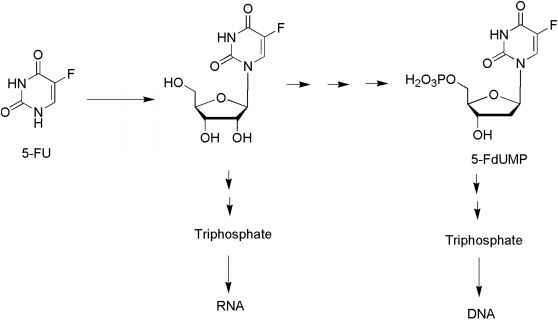 The ribose diphosphate and triphosphates of 6-mercaptopurine are active enzyme inhibitors, and the triphosphate can be incorporated into DNA and RNA to inhibit chain elongation. The pyrimidine analog 5-fluorouracil was designed based on the observation that in certain tumors, uracil was used for nucleic acid pyrimidine biosynthesis.53 Fluorine, at the 5-position of uracil, blocks the conversion of uridy-late to thymidylate, thus diminishing DNA biosynthesis. The fluorine induced increase in acidity (inductive effect) was expected to cause the molecule to bind more strongly to enzymes of the various stages of pyrimidine biosynthesis. Thymidine is a logical target, because it is only found in DNA and not in RNA. 5-Fluorouracil is activated by anabolism to 5-fluoro-2-deoxyuridylic acid, and this activated species is a strong inhibitor of thymidylate syn-thetase, the enzyme that converts 2'-deoxyuridylic acid to thymidylic acid. Methotrexate inhibits the binding of the substrate folic acid to the enzyme dihydrofolate reductase (DHFR), resulting in reductions in the synthesis of nucleic acid bases, perhaps most importantly, the conversion of uridylate to thymidylate as catalyzed by thymidylate synthetase, which requires folate cofactors. 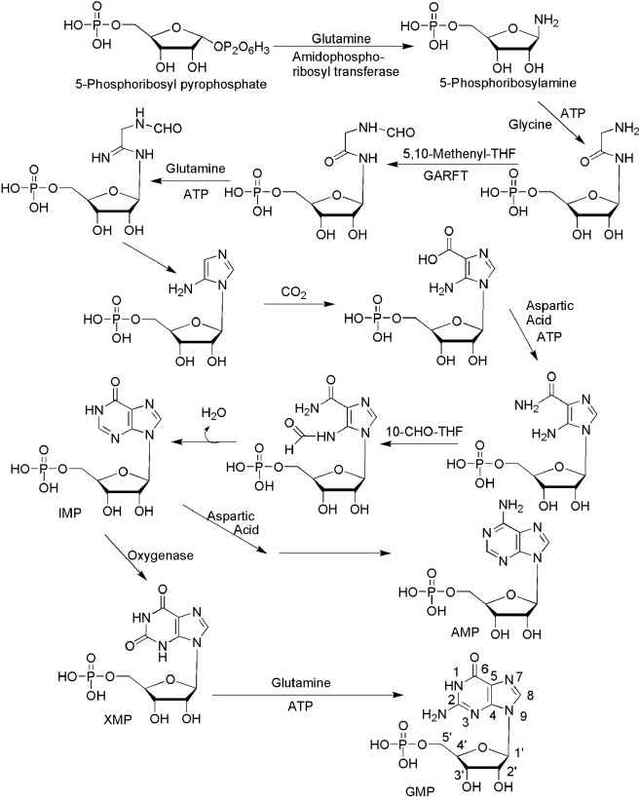 The pathways for the normal biosynthesis of the pyrimi-dine and purine bases are summarized in Schemes 10.15 and 10.16, respectively. The biosynthesis of pyrimidine and purine monomers is a central component for DNA and RNA formation in mammalian cells. The process of cell division and tissue growth is a very complex set of biochemical events with many feedback controls. Thus, antimetabolite drugs based on pyrimidine, purine, and related structures may exert their effects by altering many metabolic processes and pathways. The final step in Figure 10.15 illustrates the conversion of ribonucleotides to deoxyribonucleotides catalyzed by ribonucleotide reductase. The substrate for this enzyme is the ribonucleotide diphosphate, and the process is the same for both purine and pyrimidine bases. The anticancer drugs based on pyrimidine structure are shown in Figure 10.8. The pyrimidine derivative 5-fluo-rouracil (5-FU) was designed to block the conversion of uridine to thymidine. 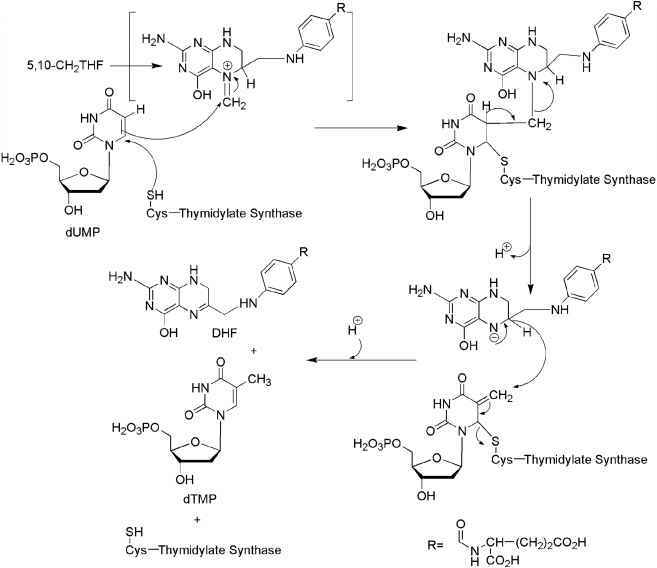 The normal biosynthesis of thymidine involves methylation of the 5-position of the pyrimidine ring of uridine. The replacement of the hydrogen at the 5-posi-tion of uracil with a fluorine results in an antimetabolite drug, leading to the formation of a stable covalent ternary complex composed of 5-FU, thymidylate synthase (TS), and cofactor (a tetrahydrofolate species). The normal pathway for the formation of thymidine from uridine catalyzed by the enzyme TS is shown in Scheme 10.17. Anticancer drugs targeting this enzyme should selectively inhibit the formation of DNA because thymidine is not a normal component of RNA. Scheme 10.15 • Biosynthetic pathway for pyrimidine nucleotides. The iminium ion is likely formed at N-5 because it is the more basic of the two nitrogens, whereas N-10 is the better leaving group. The loss of the proton at the 5-position of dUMP and elimination of folate yields the exocyclic methylene uracil species. 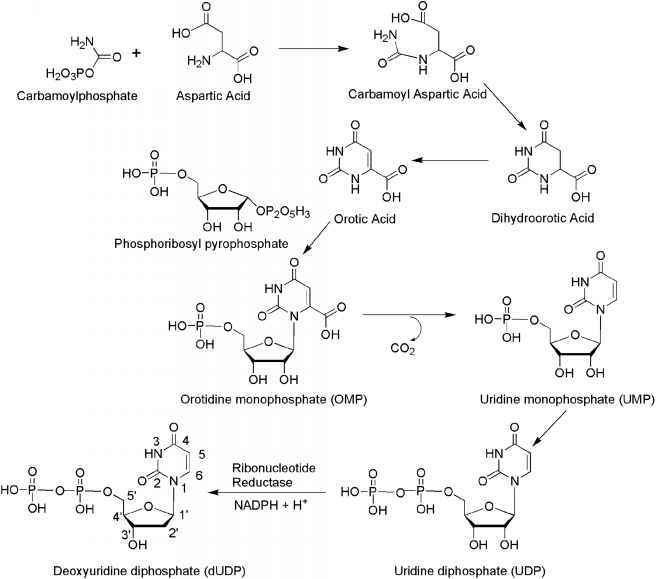 The final step involves hydride transfer from THF and elimination to yield the enzyme, DHF, and dTMP. 5-Fluorouracil is activated by conversion to the corresponding nucleotide species,53 5-fluoro-2-deoxyuridylic acid (see Scheme 10.18). The resulting 5-fluoro-2'-de-oxyuridylic acid is a powerful inhibitor of thymidylate syn-thetase, the enzyme that converts 2'-deoxyuridylic acid to thymidylic acid. In the inhibiting reaction, the sulfhydryl group of TS adds via conjugate addition to the 6-position of the fluorouracil moiety (Scheme 10.19). The carbon at the 5-position then binds to the methylene group of 5,10-methylenetetrahydrofolate following initial formation of the more electrophilic form of folate the N-5-iminium ion. In the normal process, this step is followed by the elimination of dihydrofolate from the ternary complex, regeneration of the active enzyme species, and the product thymidine. Central to this process is the loss of the proton at the 5-position of uracil to form the exocyclic methylene uracil species. The 5-fluorine is stable to elimination, and a terminal product results, involving the enzyme, cofactor, and substrate, all covalently bonded (Scheme 10.19). The chemical mechanism of inhibition of thymidylate synthetase by 5-fluorouracil is shown in Scheme 10.19. This process clearly shows that in order to inactivate the TS enzyme, both 5-FU and the tetrahydrofolate species are required to form the ternary complex. Some clinical studies have shown that administration of a tetrahydrofolate source prior to treatment with 5-FU results in greater inhibition of total TS activity. The administered source of active 5,10-methylenetetrahydrofolate is leucovorin, N-5-formyl-tetrahydrofolate. Figure 10.8 • Anticancer drugs based on pyrimidine and related compounds. nucleotide is a substrate for RNA polymerases, and 5-FU is incorporated into the RNA of some cell lines. The incorporation of 5-FU into DNA via DNA polymerase occurs in some tissue lines even though uracil is not a common component of human DNA. The 5-FU in DNA likely serves as substrate for the editing and repair enzymes involved in DNA processing for cell division and tissue growth. The actual addition of 5-FU into RNA and/or DNA may not be the direct cytotoxic event, but the incorporation may lead to less efficient utilization of cellular resources. The significance of these various mechanisms on the overall cytotoxic effects of 5-FU may vary with cell line and tissue. Scheme 10.17 • Biochemical conversion of uridine to thymidine. Scheme 10.18 • Metabolic activation of 5-fluorouracil to 5-FdUMP. Scheme 10.19 • Mechanism of inhibition of TS by 5-fluorouracil. Scheme 10.20 • Catabolic inactivation of 5-FU by dihydropyrimidine dehydrogenase.